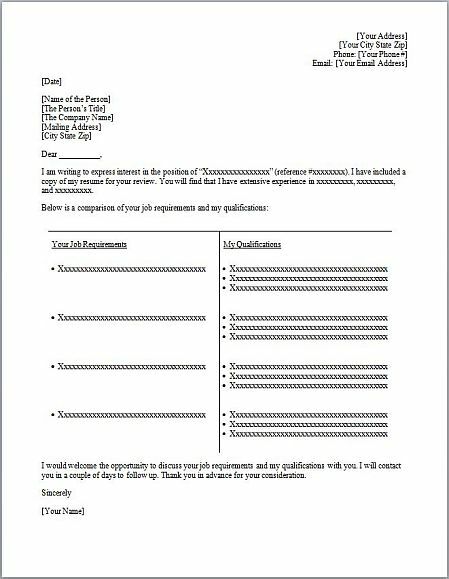 ► Formatted “T” Cover Letter Template. ► Plain Text Email Version of “T” Cover Letter Template. The Brutal Truth on How Résumés Get Eliminated	The Résumé Test & Checklist: Does Yours Pass? I’ve been sending the T-letter format for 10 yrs. It has always proved beneficial. Once your requirements are in place, they rarely chance. Pull their requirments from their ad. It takes 10 minutes to write a stellar cover letter. Learn this. It will pay off! Correction…once your qualifications are in place, you add their requirements. oops! so let me get this straight… the ability to write a well-written, clear and eloquent cover letter no longer means squat? what you’ve shown here is NOT a cover letter, in fact it isn’t a letter at all, its an excel chart with a few words of fluff built around it. these articles have definitely been eye openers for me, i have to retrain myself to think of the recruiter as a 2 year old with a 10 second attention span. weird. I am no 2 year old (although sometimes I do wish I could go back in time to that simpler era and do it all over again … only this time I’d skip the teen years!) But it’s not such a simpler time and the rules of the employment game have changed drastically. Applying for a job in today’s overcrowded market is not an essay contest where the most “eloquent” letter wins a prize. Only after you’ve been in the place of a person who must review hundreds and hundreds of applications for a single job with very specific requirements, might you see the value in the “T” Cover letter that others have seen. It does work. Michael, thank you as well. I think this will be very beneficial in my pursuit of a new position. I agree it will work well for myself and in gaining a recruiter’s attention. Thank you, Michael, for sharing this wonderful and helpful tool. I have used it several times and it has proven successful in catching the recruiter’s attention, saving him/her time. Also, It has given me a strategy of assessment to use when evaluating if a new opportunity is indeed one I should consider and pursue. I read with zeal your Recruiter Musings. You have some great stuff. Your content is not only right on philosophically (as in accords with reality) but very insightful and detailed. I’m glad you take the time to write it. You bet – as a hiring manager or recruiter, this would grab my attention over another dry, standard everyday letter or resume. What’s your advice on the pre-formatted coverletter though? The ones everyone posts on the job boards? It’s difficult to compare specifics when you don’t have any without writing and posting a new cover letter for every job listed on the board. I think I’ve found one way that might work. I would create a new cover letter for each job application you submit through the job boards, and not use a “one-size-fits-all” pre-formatted letter. Thank you so much for that helpful tool. It is few months that I have been looking for a job and this is the first time I come across this idea. It makes me wonder about the fate of all the numerous cover letters and Resumes I have sent up to now. By the way, do you think that “T” cover letter is also relevant for applying an internship position? I might agree with “it certainly can’t hurt” but you would still be playing into the matching process. If the company is big enough to have HR they will first do a negative selection. “Let’s get rid of as many of these resumes as quickly as possible!” e.g. wrong zip code, no degree, wrong degree, no PAR statements, out of work for too long, not held similar position, spelling or grammatical errors, etc and on and on. Resume (and cover letter) submission is an action that has two sides to it, the employers and the prospect; how does the employer discern that this person is worth ‘considering’ for the open position? How does the prospect make sure that his submission will strike gold? If he/she can avoid all of the aforementioned negatives then the decision will come back to the matching process. How well does the candidates previous experience (and current or previous position) and education match the job description? At this point the ‘T’ letter might be a positive factor but a cover letter explaining (with facts) how he/she will help the employer solve ‘the’ problem and make or save them “money” will have a bigger impact, maybe not with HR but certainly with the hiring manager. At some point in the resume evaluation process HR will exceed its capabilities to match the prospect to the job description. At that point the short pile of resumes will be sent to the hiring manager, for further culling. If the candidate passes that test he/she might be put on the short list and maybe brought in for an interview or given a screening interview by telephone. Why not try to bypass all of that selection process (and its many pitfalls) by appealing directly to the hiring manager? In the long run the hiring manager will still have a serious problem in picking the “best candidate” anyway. If the candidate realizes that she/he has to sell her/himself into the position their preparation will be much better and they will match themselves to all aspects of the job requirement, ‘T’ letter or not. I agree 100% with your assessment of how the weeding-out process works. If you plan to bypass HR and go directly to a hiring manager (which is usually a much better approach than just applying online and hoping for the best), then skip the “T” Letter write a more directed appeal to that decision-maker. Thanks for your comments Michael. Despite what I just indicated, it has been my experience that few candidates have the ability to synthesize a “direct approach” program for themselves. It appears that 99% of the job seekers are still submitting resumes on line. The TV ad’ that “The Ladders” has, showing a tennis match; is a great allegorical example (with all the confusion and clutter) of the internet hiring process. Unfortunately it currently seems to be the pre-eminent way to search for a job. Making a table mapping the job requirements to your qualifications saves the hiring manager the time an effort needed to do the mapping, and can be used to add relevant qualifications that did not make it into the resume. The challenge is to keep the entries very brief. Even though recruiters may not necessarily rush to look at a cover letter, sending one may still be expected for professional opportunities. I myself will read the resume first, but then certainly review the cover letter if the resume is of interest to me. Great article again Michael. Thanks for sharing. I’ve been circulating your article to different people in my network this morning. Thanks for posting this. I like the T type of cover letter best also (although I didn’t know it was called a “T cover letter”). I have noticed that the T format is neither encouraged nor talked about as much as the old fashioned cover letters that don’t even get you noticed. I am surprised that companies aren’t encouraging or even insisting upon the T cover letter. Jolly good stuff! First time i hear about the T-letter. Good way to draw valued comparisons between experience and requirements. But i agree with Amy [who commented: “So obvious and insightful into the needs of those looking for the perfect match. But suggest there needs to be a strategic space for the key reason one is better than other candidates — the emotional clincher that assures you go into the ‘must interview’ pile.”] Aside from crossing your “T”, you need to also strategically dot your “I” ! Impressed. First time I have heard about the T letter. I also agree with Amy & Mika … The emotional clincher or the dot on your “i” is a must too. Great stuff Michael. Like some of us, I had not heard of a T letter as well. I really do like it a lot and think it will be killer. I will definitely be forwardig this around to my fellow memebers in my group on linkedin as well a few of my friends. I felt that this will definitely change my conversations with recruiters in the future. Thanks and I will update you after the change. This article makes complete sense and also provides the tools to implement a successful application to a desired and matching job. Nice posting. Thanks for this, Michael. It was very detailed and helpful–and came perfectly timed for the work that I’m doing on revising my cover letter! I only recently became aware of the ‘T’ letter and have to say I love it! I find it makes everything so much easier for all parties – it provides a clear and succinct coverage of what the employer is looking for (from the posting) and the skills the applicant has that matches those needs (from the resume). It makes it easy for the employer to see quickly if the individual has a match to points that are key for them and ensures that it will be worthwhile for them to turn to the resume to dig deeper into the person’s background. Just a note to say thanks for your articles in Recruiter Musings. I always learn something new from them. Nice job. Great discussion! I recently followed up my online resume and online cover letter with a branding statement brochure directed to the hiring manager. My resume was either eliminated by keyword process or there was a mix up because the hiring manager suddenly left and someone else was in charge. At any rate, that brochure was the reason the new hiring manager called me, saying she never would have known I applied for the position had I not sent a brochure and indicated that I had applied. This resulted in their company flying me out for four interviews with executives at their company. I would like to know about the key word elimination process, because many good candidates could be falling through the cracks. It’s not always possible to correctly guess what key words the employer will screen for. Regarding the keywords … the best place to start is with a company’s job description. When applying to a specific job, make sure that the phrases, keywords and language found that job description also appear in your resume. Use them in the “T” Cover Letter as well. Thank you! I liked the “T” cover leter idea – simple and must be very efficient. Michael – You’re right on with your assessment on resume reviewing. As a manager who has had to sift through dozens of resumes at a time, the average time is less than 30 seconds on the first pass. That’s why proper format and spell check are so important. If I come across two misspelled words the resume is toast. And if the resume reads like a job description, less than 10 seconds and it’s turned over. Your message on the T format cover letter really hit home. I was introduced to the format about 15 years ago, used it during job searches, and almost always received favorable comments about it when I got an interview. It was the final element that put me in front of the recruiter. Now that I’m once again exploring opportunities in the marketplace I have done exactly what you wrote: spent hours dusting off my resume and polishing it up. But when I submitted my new resume, I reverted back to the old, boring, faceless cover letter. Thank you for waking me up! I’m back to the T format again. 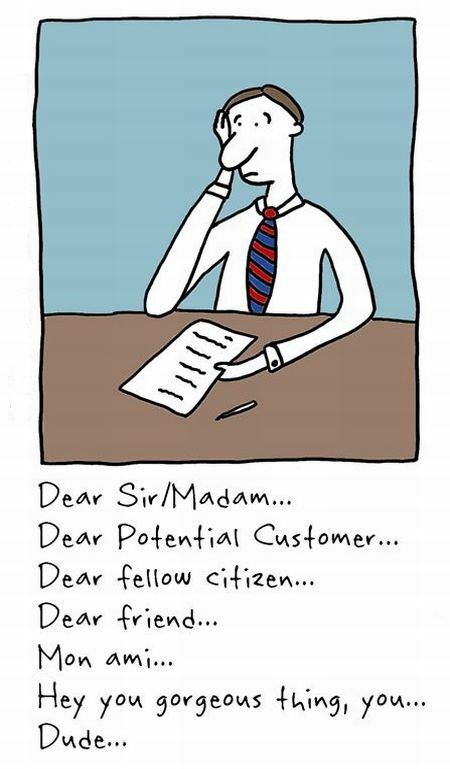 I personally think that the cover letters works only to find out the level of language command. This type of letter convey more information rather the blal bla ones which on top of this could be written from somebody else. I have written a lot of Cl and I do not have a lot of feedbacks on them. The employer does not read them at all. An assistant does and the recruiter does. Could you some body tell me what is the value preposition of the requiters in the era of Internet? Your comments are quite amusing … although I’m quite sure you didn’t intend for them to be funny. If you think that cover letters are used to find out a person’s level of language command — well, then I suggest you find someone who has a better command of English to proof-read your writings! Perhaps your “blal bla ones” don’t really deserve “a lot of feedbacks.” And anyway – what’s wrong with assessing someone’s written communication skills by reading their cover letter? The ability to write clearly and effectively is a key skill for many jobs. And as to the value “preposition of requiters” … well, if you really believe that recruiters have no value in the era of the internet, then I suggest you read The Real Truth About Working with Recruiters. Good recruiters are making a ton of money by placing hard-to-find talent in today’s high tech world. In the staffing world, the internet is merely a collection of tools — not a replacement for relationships with hiring authorities, which is what good recruiters bring to the table. I hope this comment isn’t too late to get a response! I am applying for a early childhood educator position. My gut tells me that a more traditional format of cover letter would be more appropriate for this sort of position, as personability is just as important as fundamental qualifications. I also want to be able to provide a bit of explanation regarding a job i left only two months in last year. On the other hand, the early childhood center is based at a large university, and I am not clear on the stages that my cover letter and resume will go through before being evaluated by the person who is responsible for making the hiring decision. It may be that my resume will be directed through HR before even seeing the light of day. Any tips on how best to navigate these conflicts? The type of cover letter you choose to send depends on how and to whom you are applying. If you are simply applying online to a job posting, then the T-Letter is the best way to start. If, on the other hand, you are sending it directly to a decision maker that you’ve identified in the early childhood center … then your more “personable” approach may be a better choice. Since you seem to be unsure who will see it first — I would assume an HR person will be the first one to look at your letter and resume. If you have a job description with a list of requirements, then by all means send the T-Letter first! You can always follow up later with a more traditional letter to the actual hiring manager once you know who that is and you’ve passed through that first HR gatekeeper stage. Nice job, this is a great way to let the reader know that you have the skills to solve their problems. I don’t normally take time to comment on web postings, but I just ran across your article regarding The “T” Cover Letter, and I wanted to simply thank you for sharing this information. I’ve been familiar with the T format for many years, but frankly don’t often use it. Nevertheless, your advice provided an absolutely spot-on view on its value (I’ll definitely use it going forward), as well as other really great tips! Thanks again! I don’t think this would be as effective for a recent graduate who may not have as many qualifications to list next to each job requirement. Nikitasha: No offense, but if you really don’t have the qualifications required for a job you are applying for … you probably won’t get much of a response no matter what type of cover letter you use. It’s probably a waste of your time (as well as the time of the person you send it to) applying to a job that has requirements that you do not yet possess because of your inexperience as a recent graduate. Given that most people do not meet every single job requirement in a job ad because employers post for the ideal candidate (especially in my field of Graphic Design), if I meet seven out of ten requirements, doesn’t the T cover letter make it more obvious that I don’t meet all of their requirements? If so, would you suggest that I do an old-fashioned cover letter for those job listings and using a T cover letter only when I meet every single requirement? Why not just cut and paste the seven requirements that you do fit, and list your experiences and skills next to those. I would ignore the three you don’t have in the cover letter, and save your explanations about those things (only if asked) for an interview. I could not agree more with everything you said. I am a recruiter too, and all the facts you mentioned about our methods are so true. In reply to some comments here, if you think about the role of the recruiter and how little time we usually have to go through hundreds of CVs, reality leaves us little choice but learning how to skim through hundreds of documents in a day and be able to extract what we need from them. The T-cover letter might not be a conventional letter, but surely helps your words to be noticed sooner. I do not consider myself a ruthless recruiter, I´d rather say an incredibly-busy-recruiter, I know what I am looking for in a CV, and this chart will tell me straght away. If your cover letter helps me find what I need so easily I can guarantee I will be spending more than 30 seconds reviewing your CV. Great advice again. I enjoyed reading it! I like this idea and have been doing something similar but not quite this structured. I will definitely give the T Cover letter a go. Thanks for the template. Any advice on how (or if) to use a T CL when the job posting doesn’t divulge many details? great advice — I have been struggling with this and appreciate your recommendations. These are great tips. Especially the tip about the ways of sending cover letters. The point of cover letters is to show an employer why they should hire u.
Hi, I love this format for a cover letter! I do have a question though. Say a job listing has 8 or 9 job requirements. Would you list them all or just list the most important ones so that it stays to one page. I am trying to apply for this job and I feel very qualified at all the job requirements so I feel hard cutting some out when I can adequately perform all of them. It seems that you have 3 choices: 1) Expand the T-Cover Letter chart to include all 8 or 9 job requirements and your matching skills; 2) Choose just the 4 or 5 that seem the most important; or 3) Combine some of the requirements and have fewer but longer bullets. If you really feel that they are all important and distinct, I’d lean towards listing them all and just have the letter be longer. I think any of those formats would work. Hope that is helpful. I wouldn’t mind composing a post or elaborating on a number of the subjects you write concerning here. Again, awesome website! I’m so glad to hear you are finding value in my blog writings! I do not use “guest writers” … however, I’ve certainly had many readers write very elaborate and informative comments that become part of each article I write. I am also always open to suggestions for new topics that I can write about. This is a terrific site that’s been a great help as I’ve started my first job hunt since I was fresh out of school. One online job posting I’m looking at requires an uploaded resume but has only a (large) text field for a cover letter. Since I have no idea what the formatting of the submission will end up looking like, I can’t use a standard T-letter. Any suggestions for the best approach here? I’m glad to hear that my blog has been helpful to you in your job search. The answer to your question is easy: use the second template in the article above, which is a plain text version of the “T” Cover Letter designed for the body of an email. Since it has no fancy formatting, using it in the text field of your online application should not be a problem. Thanks. I’ll leave “attention to detial” off my resume. Nice! You might want to check out the “Resume Bloopers” at the bottom of this blog: Comic Relief: Job-Seeking Humor – Volume 3. I’ve been using this letter and I have been unable to get any resume response with it. I have other people suggesting that I go back to the 3-4 paragraph style. What should I do? If you truly fit all the requirements for the job you are applying to, then I’ve found that a T-Letter helps your chances of getting a response. On the other hand, if you really don’t fit or are not as strong as other applicants, then no response should be expected no matter what type of cover letter you use. That said, go ahead and try other cover letter styles … use whatever works for you! Thank you for your insightful words Michael. Still applicable after first writing it four years ago. Much appreciated! My brother suggested I might like this web site. He was entirely right. This post truly made my day. You can not imagine simply how much time I have spent looking for this information! Thanks! Anyways, I teach my clients to tailor their resume in a similar manner to your T-letter: I hand them a piece of paper with a big T on it, and we pick out the job requirements from the posting and write them on one side and pick out experience/qualifications from the clients skill set that correspond, and THOSE are then typed into (or pasted if we did it electronically in a slightly more sophisticated version) the resume. I really like the T letter format, but this leaves them with the problem of potentially just regurgitating the resume in the cover letter. Any thoughts on this? A “T” style cover letter simply addresses the exact job requirements and can contain detail that cannot be included in a cover letter. It is as direct, specific, and to the point as possible in text. It should reduce the work of evaluating the applicant. I makes the resume a backup document if used properly. As a Certified Career Strategist, Career Coach and professional Resume Writer specializing in midcareer professionals in transition, the T covering letter can be appropriately used in some instances especially technical resumes, or where specialized equipment experience is needed because this put the candidate’s information up front and centre. As a former recruiter, this form was something that was used to skill match the client’s qualification to the job posting. I agree with one poster that the covering letter can be used to gauge a client’s writing and communication skills however if the client has hired a professional resume writer than nullifies that qualifying attempt. Although there is a positive benefit to the T format, this formatting may not be compatible with an ATS (applicant tracking system) commonly used when uploading to job boards which requires simple formatting and basic structure. Thanks for your comments. Two things: 1) If someone hires a “professional resume writer,” they would still probably write their own cover letters for individual job applications. That, plus any other emails or communications between a candidate and a recruiter or prospective employer will probably reveal a person’s true writing and communications skills. And 2) as mentioned in the blog, there is a second “plain-text” version of the T-Cover Letter that can be used in the body of an email or on a web-based application form. That alternative plain-text version will most likely be compatible with any ATS, since is has no fancy formatting. 1.The biggest issue is that the person reading the resume and cover is usually NOT the hiring manager and probably knows NOTHING about anything to do with the actual job or its requirements. 2. The second issue is that there is NO excuse for spending 10-20 seconds reviewing ANYTHING, EVER. It means that the person doing the sorting and reviewing is actually costing the company time, energy and effort with very little possibility of not tossing the BEST candidates resumes aside. See number 1. 3. Most job postings are so damn generic in themselves that no applicant can possibly create a cover/resume that matches the job in any way. We all see the same buzz words (which change regularly) and descriptions….however one company is an ice cream manufacturer and the next builds missiles (many times we don’t even know a company name!). The job description for a given position is the SAME…yet the personality, types of background, as well as job histories being sought in each case would be zero match to each other…. (yes one can tell that someone with an ice cream manufacturing background would not fit building missiles….however the reverse is not true at all, depending). 4. Cover letters are a waste of applicant’s time, especially when they many times do NOT KNOW the company, department, or even the industry because of today’s double blind job listings. There is little or nothing that can be said that will change the initial reviewer’s perspective, unless that person just likes to hire brown nosing bullshiLLers. 5. Lets be real, many of the positions posted today are NOT even for US citizens…they are listed to NOT hire so that companies can obtain foreign workers through special programs (supposedly to reduce costs but instead costing our society many fold any actual savings). Or possibly to hire intern level employees, where even dumbing down one’s resume can bring back the response….”you are over-qualified”. So if the point is NOT to hire fully trained, fully qualified and expert employees, then we waste everyone’s time, especially with cover letters. a. when referred to a position from someone who works there or knows the hiring managers or HR etc. b. When YOU know the hiring managers or HR personally. d. When one knows the EXACT position, department, and industry and is so familiar (expert) that they can make statements that will cause the resume to move to the TOP instantly. You must know exactly what to say and it better be excellent. Other than that, employers and HR managers should not WANT any cover letters..they should not require them ever. The resume, if written well can deliver EVERYTHING about a candidate that is necessary to assess the fit to the position and company (provided it is reviewed by a real manager and co-workers to that position. Why don’t you go and try and get that information. if it is not posted with the job listing your odds are about 1 in 12 of getting that information. most companies have a policy that they don’t give it out at all. Thy don’t want you calling and trying to talk to that person. I have even known of companies that use faked name for the responses…so you are addressing a pseudonym to begin with. Wow. So much anger and cynicism coming through in your comments, DJ! I sure hope, for your sake, that your negativity doesn’t come across so blatantly to any of the prospective employers you might be targeting — assuming you are in job search mode. While there may be truth in many of your words, I’ve found that attitude is the number one most important factor that determines who gets hired and who doesn’t. I don’t know if you’ll see this but I am so glad I came across this article. After my phone interview ended, the interviewer specifically said “You’re cover letter was very thoughtful” and now I have an in person interview next week! Yes, I actually do read people’s comments! And I’m so glad to hear that the “T-Cover Letter” article helped you get an interview. That’s the best feedback I could hope for! I like the format you are showing here! Question .. in a job posting lets say there are 8 points highlighting what they are looking for, do you try to cover each one? what if you leave one out does that look like you don’t have it? WHen submitting the application would a resume still go with this cover letter? If you have all 8 points then by all means list all 8. If not, then only leave out ones you do not have. And yes, submit your resume along with this T-Cover Letter. I recommend sending the resume as a word attachment, and having the cover letter be the body of your email. Any tips on writing a powerful cover letter when your application is spontaneous / unsolicited? T format would not be appropriated, unless based on the values of the company? It would depend on what position you are targeting. If there is no job description available to match up with your skills, then you simply need to bullet out your main assets, skills and experiences and hope they match up to what the company is looking for and/or in need of. Keep it short and simple — let the resume provide the details. Also — personalize it if you can! Do not send a generic one-size-fits-all cover letter. Try to mention specifics about the company, details about anyone you know there, etc. Explain why you want to work there in particular, and what you can do for them. Thank you for this wonderfully article. I have since made changes to my approach with cover letters. Now, I’m currently using a summary of qualifications section (~5 bullets) on my resume, but it’s largely a repeat from the T cover letter. Certainly I’m a huge fan of the T cover letter, but how would you suggest that I develop a summary of qualifications section? Since every job might have different requirements or look for different specific qualifications, it’s difficult to have a “one-size-fits-all” cover letter. That’s why each T-Cover Letter needs to be tailored for the specific job you are applying to. The same goes for a resume’s Summary of Qualifications section. It’s best to be very general there, and leave the specifics to the T-Cover Letter (unless you want to constantly modify your resume to fit each and every job you are sending it to — which is also a great idea, but can be very time consuming!) In a perfect world, your resume’s summary section should look like a regurgitation of the language in the specific job description you are applying for. Thank you for your response. Sometimes I ask myself where all my time goes — and it’s largely in customizing the cover letter and resume. Especially for a highly coveted job, I tend to invest more time in getting everything right. I know that this will be challenging to answer, but how much time would you recommend to edit a resume vs making a T cover letter? There’s no good way to answer this last question of yours. How much time you spend editing your resume depends on how closely it already matches, or how far off it is from the job description to which you are applying. (If it’s too far off to begin with, then I’d be wondering if you might be wasting your time even applying to that job.) Between the two, I’d say the resume more important that the cover letter, since it will ultimately be the thing most hiring managers will study. However, without a good T-Cover Letter to open the door … that look at your resume may never even happen! I find it difficult with the T Cover Letter to get it to one page. I don’t suppose the cover letter should be more than one page? How would you format the second page if need be? Thanks! I do think that one page should be the limit for a cover letter. However, that said, if you really need yours to continue into a second page — simply copy and paste the “chart” from the first page onto the second page, and then replace the text within that chart. Thanks for a nice article on T shaped cover letter. It definitely is worth trying. I have a question. The job listing I am working on has clearly two sets of requirements (a) Qualification and Experience (8 points); and (b) Personal characteristics (5 points; attention to details, interpersonal skills etc). Bulleted points of T shaped table should suffice to support the required (a). What about the (b) requirements. Should it somehow be a part of T shaped table or a paragraph like a traditional cover letter? Thanks. You could do it either way … but if the personal characteristics are each listed separately, why not just treat them the same as the other requirements and put them onto the T-Letter chart?